Horseback riding is a great way to get close to nature and explore the Islands at a slow pace. 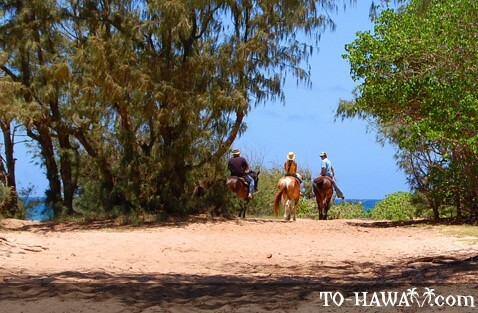 Horseback tour providers in Hawaii welcome both experienced and first-time riders. Usually a horseback riding tour is about one hour long. There are two-hour, three-hour and even longer tours as well. To guarantee the satisfaction of their customers, the horseback tour companies organize tours in small groups (private tours are offered as well). An experienced tour guide leads the group and can assist first-time riders. Stops are made at scenic points; so take your camera with you because you will have the chance to take plenty of pictures. Before you book your horseback riding tour, check if your tour company has any restrictions. Some of the companies have age, height and weight restrictions you should be aware of before you book your tour. It's also recommended that you wear closed-toed shoes and long pants. The horses are usually friendly and well-mannered. So don't be afraid to get on the horse if you are a novice. Your tour guide will provide you with clear instructions before the ride. At some stables you can even get a private horseback lesson if you want to. 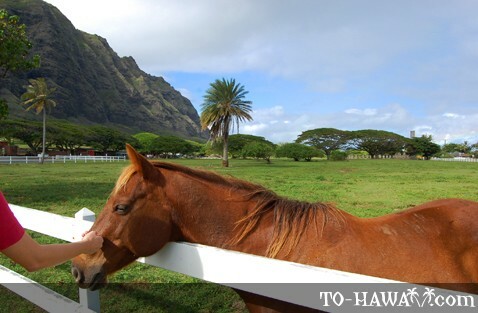 On Oahu, one of the most spectacular horseback riding sites is Kualoa Ranch, located on the windward coast. This is a place where besides beautiful ocean and valley views, you will come across famous movie locations you have seen in Jurassic Park, Godzilla, Windtalkers and 50 First Dates. 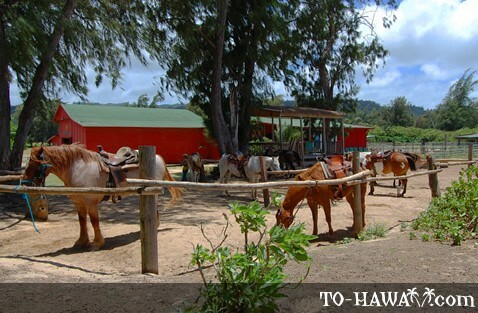 Other companies will take you for a horseback adventure on the North Shore of Oahu. Some of the highlights here include views of Ka'ena Point (northwestern tip of Oahu) and Turtle Bay. Maui's most spectacular horseback riding location is Mount Haleakala. There are many companies on the island that will be happy to take you for a horseback ride there. Haleakala is one of the largest dormant volcanoes on Earth and a must-see if you are on Maui. While riding on the foothills of Haleakala, you will see amazing flora you can't see anywhere else in the world, such as the endemic silversword flower. Besides the unique views, your guide will tell you about the island's history, flora, fauna and the geology of the volcano. Another remarkable horseback riding location on Maui is Kipahulu - an ancient land filled with hidden stories and historical events. You will see legendary sites and you will have the chance to learn about the culture and the history of the ancient Hawaiians. Kauai's beauty is endless. There are numerous ways of exploring it. And riding a horse is just one of them. You'll ride off the road and into the green to explore lush tropical rainforests, cascading waterfalls and hills. 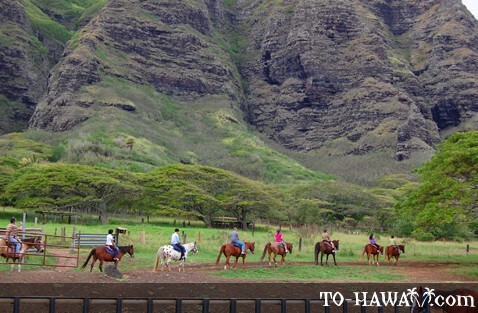 You can find great horseback riding tours in Princeville on the north shore. The natural scenery there is breathtaking and you'll enjoy both mountain and ocean views. Some of the highlights in the area are Anini Reef, which is the largest reef in Hawaii and Kilauea Lighthouse, a bird sanctuary. 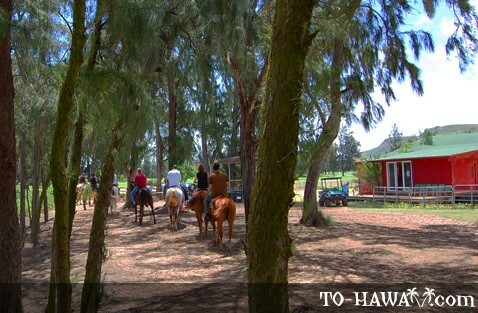 On the Big Island, the best horseback riding locations are in northern part of the island. Waipio Valley is the most popular and favorite horseback-riding site. The views are truly stunning - lush tropical valleys, cascading waterfalls, cliff edges and taro patches. About 72 miles (115 km) from Waipio Valley is Kona. There are a few horseback riding companies that can take you for a horseback adventure to Kealakekua Bay.